My friend Deb, from Bagni di Lucca and Beyond, wrote this post. I feel that it is so important for travellers to Italy to know this, that I have decided to reblog the article. 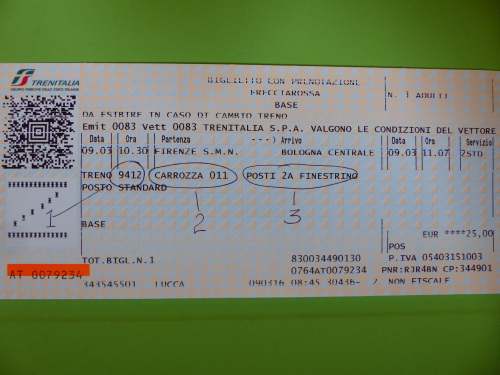 You might think this would be easy, but every time I get on a Freccia Rossa, Freccia Bianca or Freccia Argento (Red Arrow, White Arrow or Silver Arrow) there is confusion over the seating arrangements. These fast trains, which can travel at speeds of 250 kilometres per hour, are run by Trenitalia. They were previously called Eurostar Italia, but the name changed in 2012. The whole thing can be very confusing for a first timer. You are in a bit of a rush, you have too much luggage and everything is unfamiliar. You can buy a ticket from the sales counter (expect a long wait) or from the automatic machines, a much speedier way to do it. Here is the ticket you will most likely receive. The circled and numbered items on the ticket are what you need to look for. Very wise infor on trains in Italy. Buy from machines, I waited in a queue for 40 mins . Thanks Gail, and that wait in line can cause you to miss your train, I know, it happened to me. Great information! Thanks for sharing Lyn& Deb.